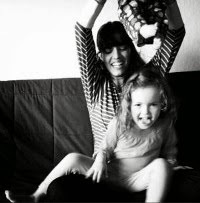 I have always wanted to be a mother. I'm not sure why. No one really glorified the task for me, so really I have no one to blame for immersing myself into motherhood at the ripe age of 23 (I guess I can also blame a certain Christian Palmer for having something to do with it). When I was 13 I had my first ultrasound because of an ovarian cist. It wasn't a big deal but I was terrified that the ultrasound would revel some terrible truth -- a horrible medical condition that made me infertile. My 13 year old fears were unfounded because 10 years later I became a mother. And it only took me 45 hours of labor and 4 hours of pushing to make it happen. But it happened. I gave birth to a 9 lbs baby boy. Before I had Enzo I had set schedules and color coded calendars, I was seriously the perfect mother. My imaginary kids were always clean and nicely groomed, and never misbehaved. Did I tell you that last week when I went to Target to buy the rest of Enzo's party decorations Baby Maria managed to pee on the floor and then proceeded to try and splash in the pee puddle? Enzo was encouraging his little sister like crazy -- to act crazy. And I, in full parent mode, almost peed my pants laughing at her. Yeah, that perfect mother of my dreams died the minute this little dude was born. This weekend we celebrated Enzo in full pirate party extravaganza. Remember how I told you I wasn't going to blog last week because I would be busy preparing for Enzo's party? Well... the preparation really took full steam the day before the party. Sometimes I pretend that I have more time than I actually do and before I know it I'm disoriented trying to figure out where the time went because I swear I was just giving birth to Enzo yesterday and today he's giving opinions on how to decorate his birthday cake. 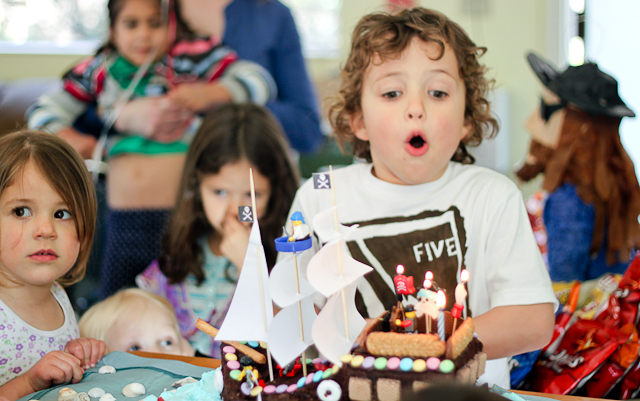 The pirate theme didn't come naturally, meaning he doesn't play pirates every waking minute of his life like he did at age 3 and age 4 when he was obsessed with trains and made it obvious that he wanted a train cake for his birthday. At first he asked for a STOP sign cake. This was back in October when he was learning how to read and could recognize STOP signs. Christian was elated with his easy request. But the STOP sign cake idea was short lived, because even Enzo is smart enough to figure out that STOP signs are boring. He didn't want boring, he wanted exciting. In Enzo's world the definition of exciting is the ever addicting i-phone game, the one and only, Angry Birds. He really wanted an Angry Birds cake. I showed Christian this picture and Christian said "NO WAY!" Mostly because he's anti-fondant. I'm not sure when and how Enzo decided on the pirate theme but we liked it and figured it was easy enough to pull together, even last minute. 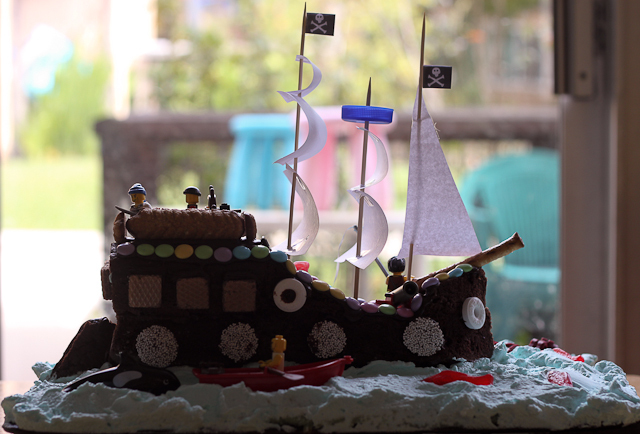 Christian, my better-baking-half, made a brilliant pirate ship cake. The Ocean was a sheet cake with whip cream that he dyed blue. 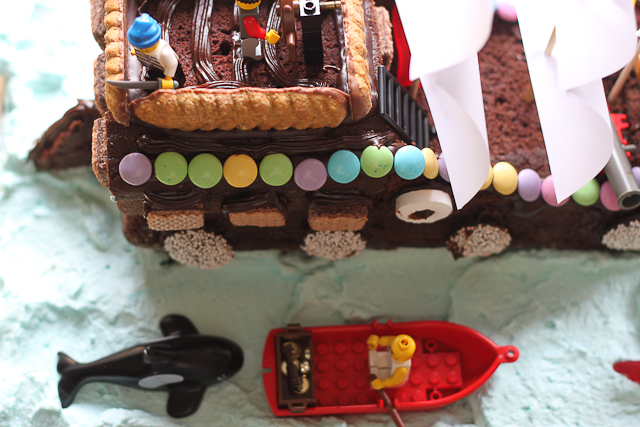 The pirate ship was chocolate cake that he made in two loaf pans, plus some treats for decorating purposes, Pirate Legos, and a whole lot of love. My ship engineering skills are pretty lame. 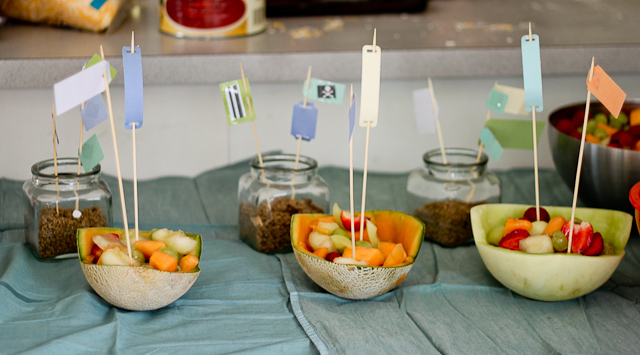 The best I could do were these pirate fruit salad ships. Not to be mistaken with regular fruit salad because pirates only eat things that start with the letter "P". Like pizza? Yes exactly! A lot of pizza was made. 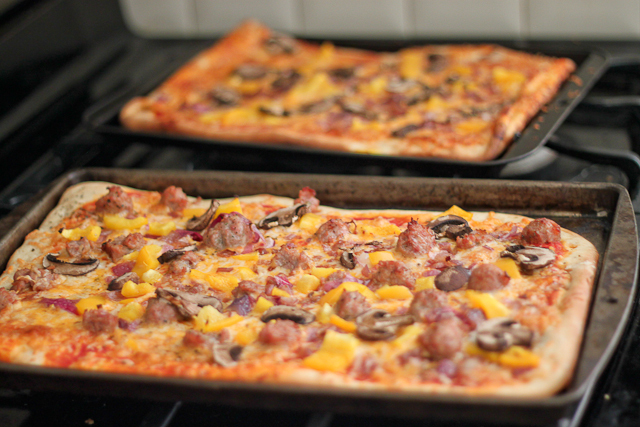 We have 4 entire leftover pizzas to eat this week. I just had a slice for breakfast. There was also popcorn and potato chips and pirate juice (really, it's just juice) and a pirate pinata which was the hit of the party (no pun intended). 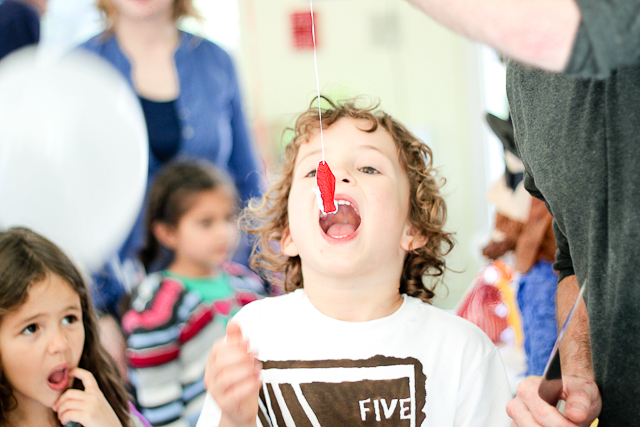 Something about a big stick, free reign to hit, and the anticipation for falling candy, makes kids really, really happy. 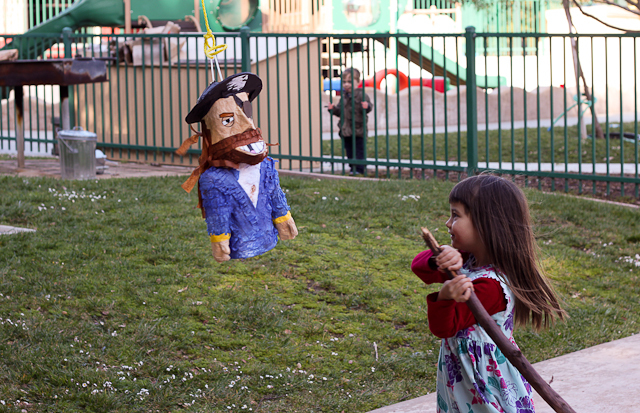 Enzo broke the pinata. I sweat it wasn't rigged, it's just that now that he's 5 he can do anything (according to him). Dude, Enzo you're 5! That's so awesome. You truely are the best thing since sliced bread. You make my world go round. You brighten my days with your sweet attitude, your funny jokes, your cute accent, your kisses, your wild dances, your contagious enthusiasm for life. If I could I would have you all over again, 45 hours of labor and all. You were so worth it. p.s. I do love me some birthday parties filled with birthday traditions. 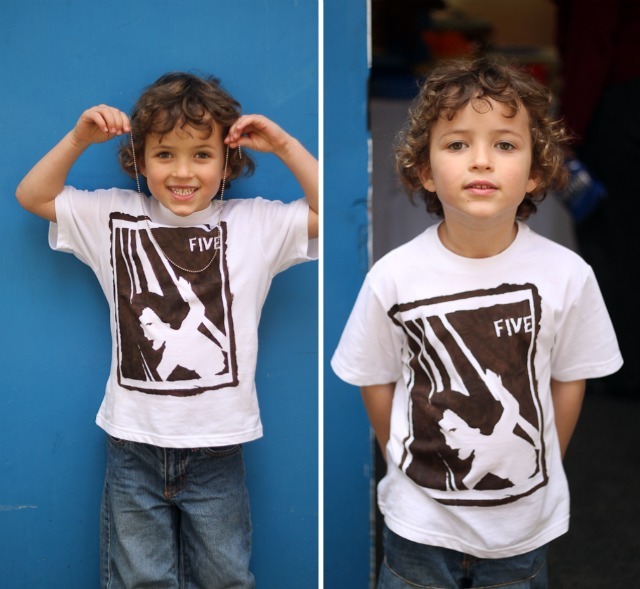 The t-shirt is a tradition I started when Enzo turned 3. Every year on his birthday he wears his birthday t-shirt that I make using freezer paper, fabric paint, and a favorite picture of that year. I'll Pay-Pal you $10 this very second if you took one look at the shirt and thought "oh yeah, Enzo laying down on the hammock." It's fine if you didn't, I'm not a hater of abstract art. Christian on the other hand was making fun of my t-shirt making shills while he artistically sculpted the pirate ship cake. Hay-ter! You can see Enzo's 4 year old t-shirt here and his 3 year old t-shirt here. And then you can tell me about your birthday traditions. Are there any special birthday traditions you do for your kids or that your parents did for you? What about cakes? Any special cakes you've made or received? I'd love to hear your birthday stories, it will make me a little less sad that the next birthday in our family is in September. That's 6 whole months, pooo!